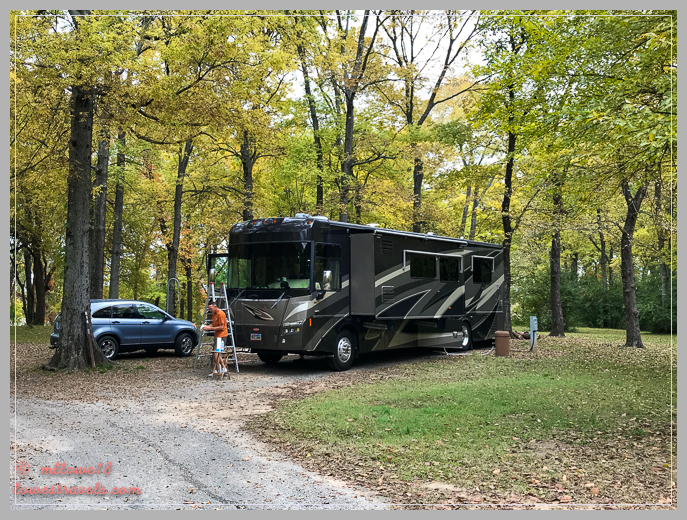 From Oklahoma City we continued our eastward trek into Arkansas and spent a couple of days (Oct 30-31) camping at Springhill Park, an Army Corps Of Engineers (COE) Campground. It was a great place to get away from urban noise and be under a canopy of trees and chirping birds. We had the park mostly to ourselves and loved the solitude of being close to nature. 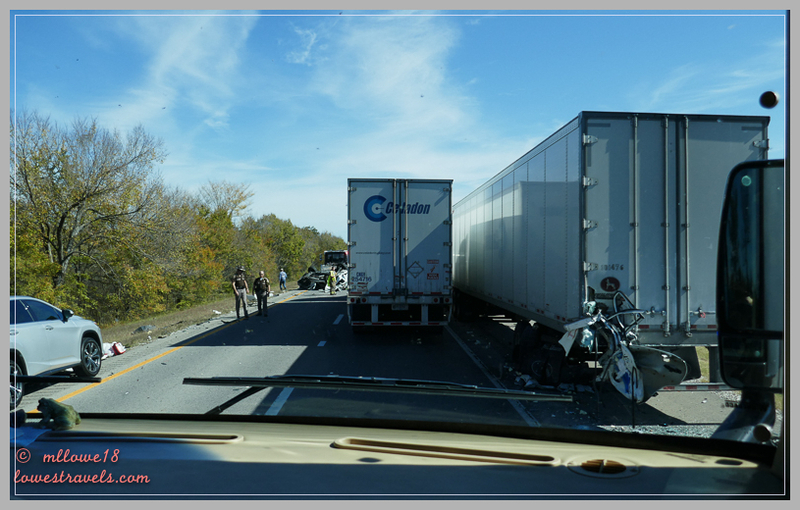 On our way to Little Rock, we encountered our first traffic jam caused by a bad accident. We sat for a half hour, but it felt like an eternity. 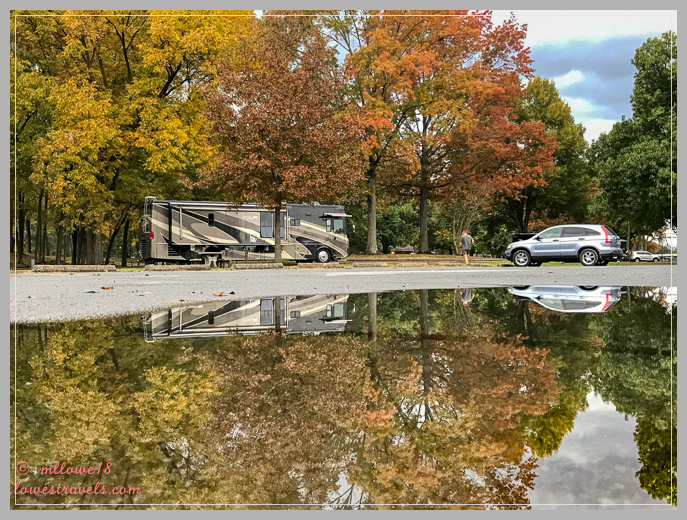 Our next home base while exploring Little Rock and Hot Springs was Maumelle Campground, also a COE campground located alongside the Arkansas River. While here we sat through another severe storm that created a nice reflecting pool right next to our site! 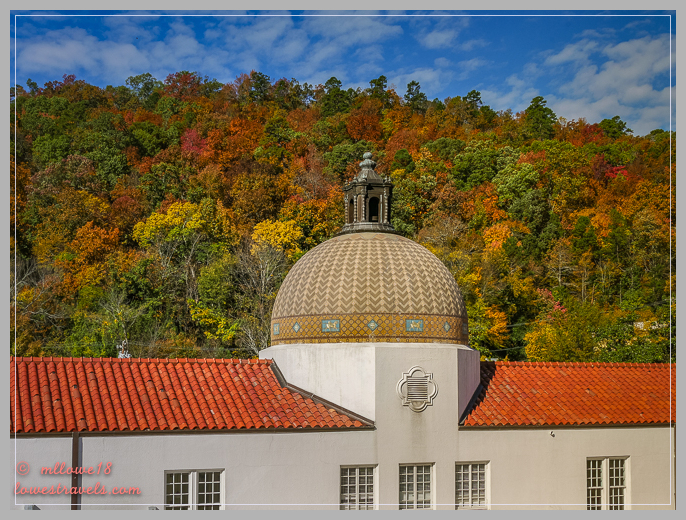 Our first exploration when the weather cleared was a drive to Hot Springs National Park. What makes this park unique is that it makes up part of a city, rather than being located miles from developed areas. It encompasses a 5,500-acre area that preserves geothermal spring water and resources related to therapeutic bathing. The hot water “with magical powers” coming out of the earth at 143º has been routed through the city’s bathhouses via an underground aqueduct. Quite ingenious, and essential to the success of the city for over 100 years. 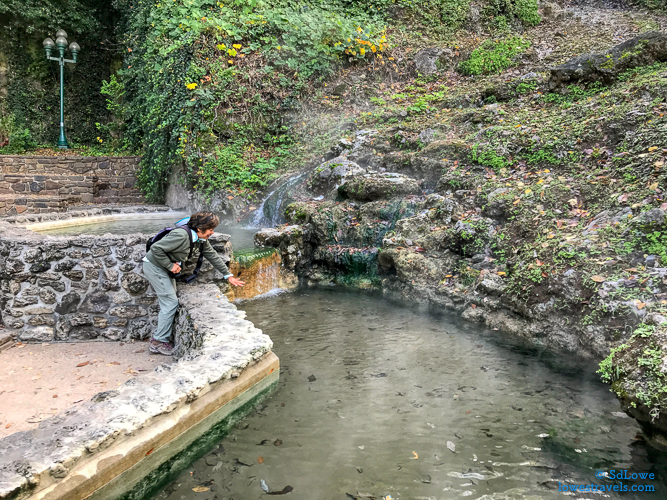 The park protects 47 hot spring as its primary resource and collects 700,000 gallons a day for use in the public drinking facilities and bathhouses. The water is drinkable and it’s provided free of charge and had we brought a container we could have taken some home. 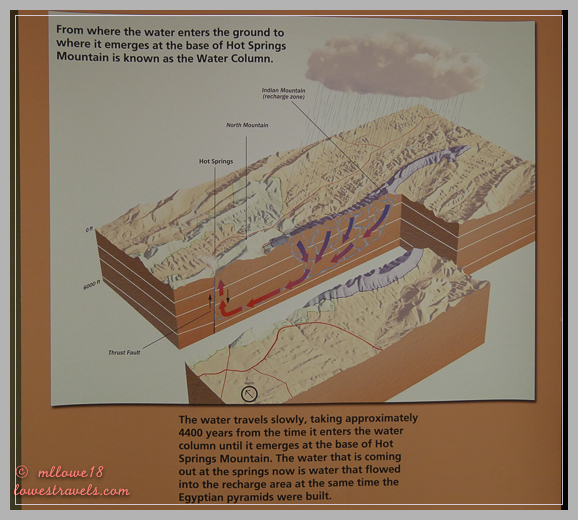 The hot springs were protected by Congress as Hot Springs Reservation in 1832, and in 1921 as Hot Springs National Park – the oldest protected area in the National Park System – was created. We can tell you from personal experience that they remain popular, as we were unable to get reservations for a private bath area during our stay. One of the few open hot springs reserved for public display and touching. 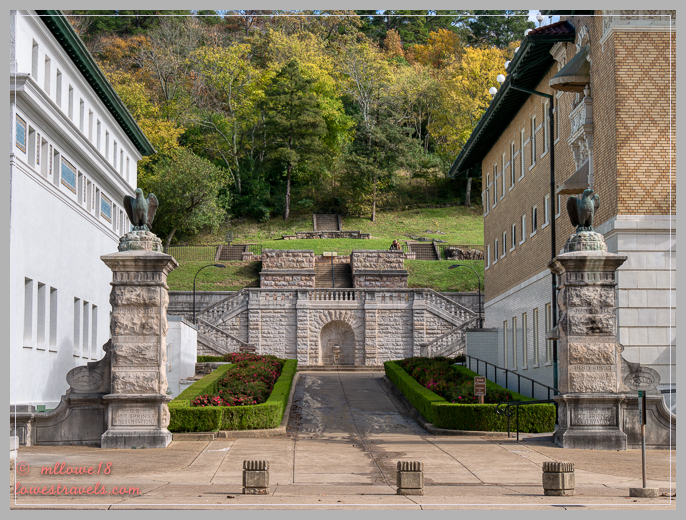 We took a self-guided tour at the restored Fordyce Bathhouse, located in the middle of Bathhouse Row. Inspired by bathhouses in Europe, Fordyce is said to have achieved the “Golden Age of Bathing”, considered to be the ultimate at the time. 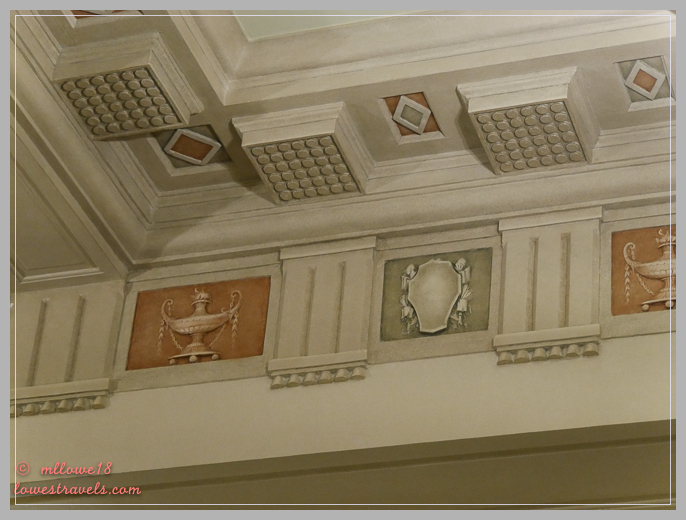 We checked out 23 restored rooms furnished as they appeared during the heyday of the spa from 1915-1962. Since we couldn’t get a reservation to bathe in the waters, we instead took a “therapeutic” hike to Hot Mountain Summit and enjoyed the Fall foliage which was on full display. 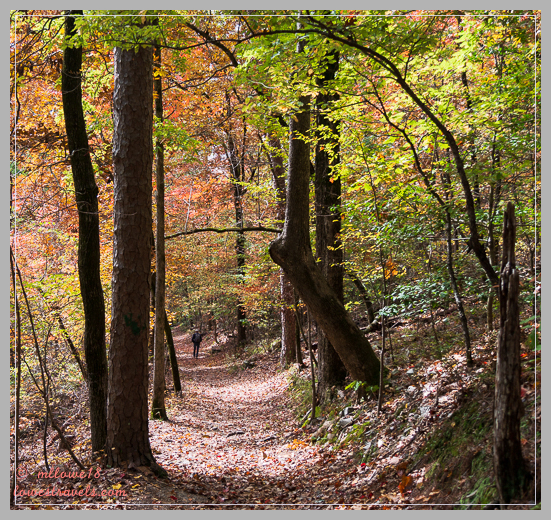 Our 7-mile trek under the colorful trees was pleasurable and scenic. 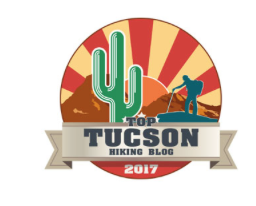 We would be remiss if we didn’t taste beer brewed at the only brewery located within a National Park. 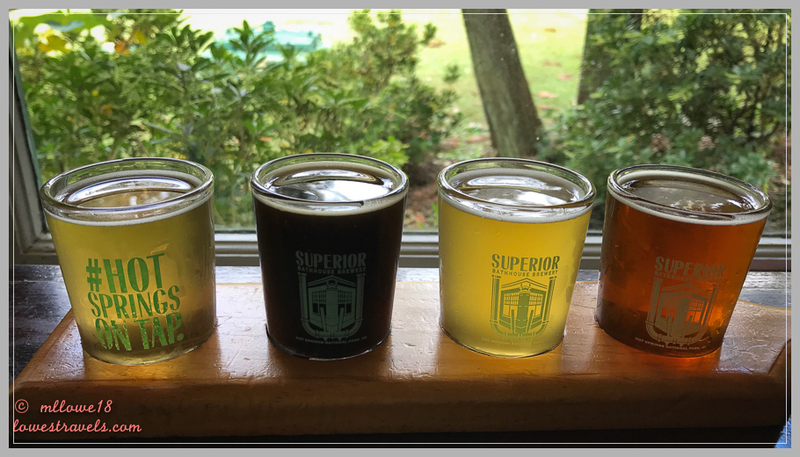 Superior Bathhouse has been revitalized and became Superior Bathhouse Brewery in 2011. They are the only brewery in the world using thermal spring water to create their excellent craft beers. This flight was a delight! On our second day here the sun became shy, hiding behind the clouds which ultimately opened up to drizzles. 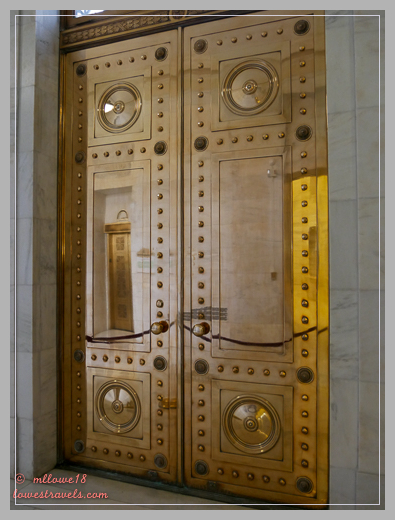 We found two indoor activities that interested us: the Purse Museum and the Arkansas State Capitol building. For some reason, Steve didn’t want to accompany me at the Purse Museum, and he took off on his own to explore the area. The Esse Purse Museum in Little Rock is the only purse museum in the U.S., and one of only two in the world (darn, I missed the other one in Amsterdam when we were there!). The little museum chronicles not only the kinds of bags American women have carried throughout history, but also the things they have carried in them. The collection of 3,000 purses were displayed by showcasing women’s purses throughout the decades along with how their use has changed over time. Four special purse exhibits – Skins, Shapes, Travel and Evening – were each highlighted with a unique diorama. The visit was interesting and worth my time and the $10 admission fee. 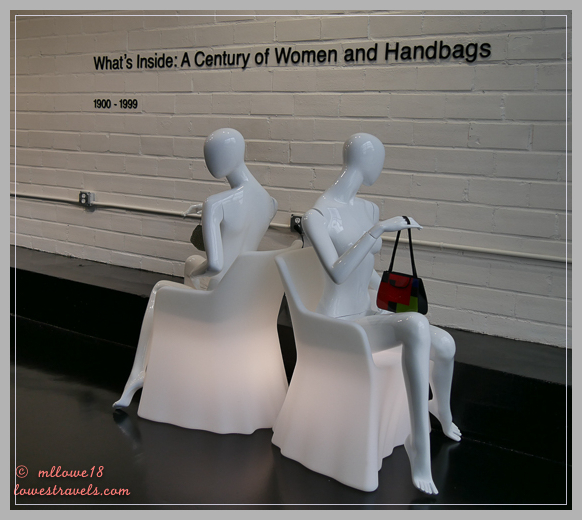 I was fascinated to learn the role of purses and their contents throughout history, and I didn’t even buy a purse while I was there! Steve picked me up, and together we visited the Arkansas State Capitol in Little Rock, the capital of the state. We did a self-guided tour and explored all four floors of the building. Construction began in 1899 and was declared completed in 1915. The capitol was built on land originally holding a state penitentiary, so a convenient labor force was available to help with the construction. 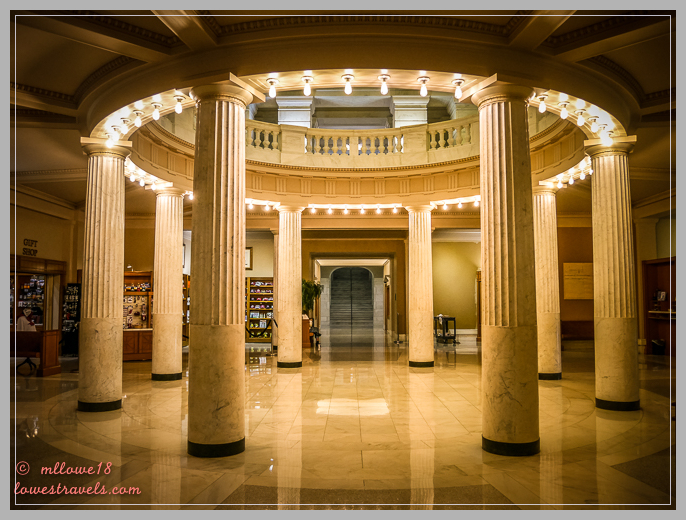 Grand staircases each leading to the Senate and House Chambers were carved of Alabama stone and the flute columns were quarried in Colorado. 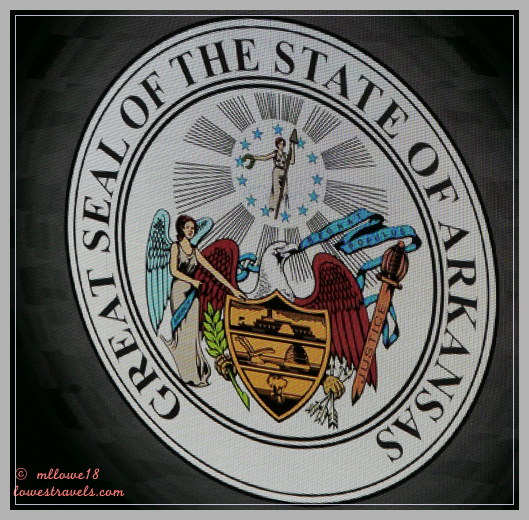 We enjoyed and learned a lot about the rich history of Arkansas through the many permanent exhibits and displays. As a small-scale replica of the United States capitol building in Washington, D.C., this state capitol has frequently been used as a filming location. Unfortunately, I don’t have pictures of the lovely outdoor areas because of the heavy rains that day. 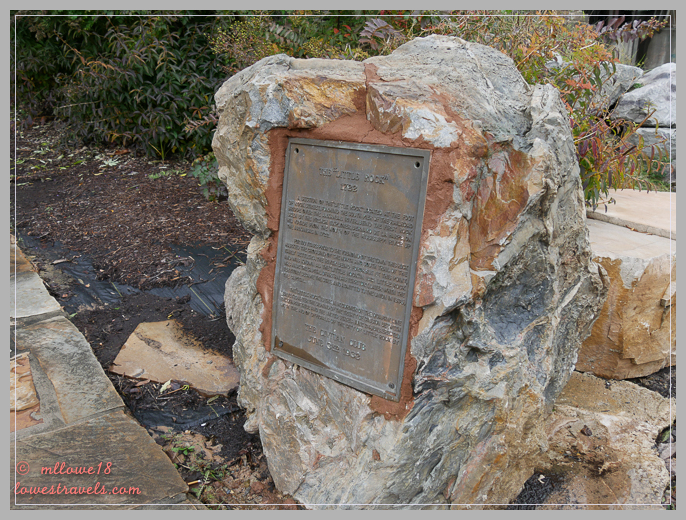 I’ve often wondered how Little Rock got its name, and we learned while meandering around the Junction Bridge that this was where a certain rock outcropping on the Arkansas River was christened by French explorer Bernard de la Harpe in 1722 as La Petite Roche – “the little rock” – and the name stuck as the area was settled. 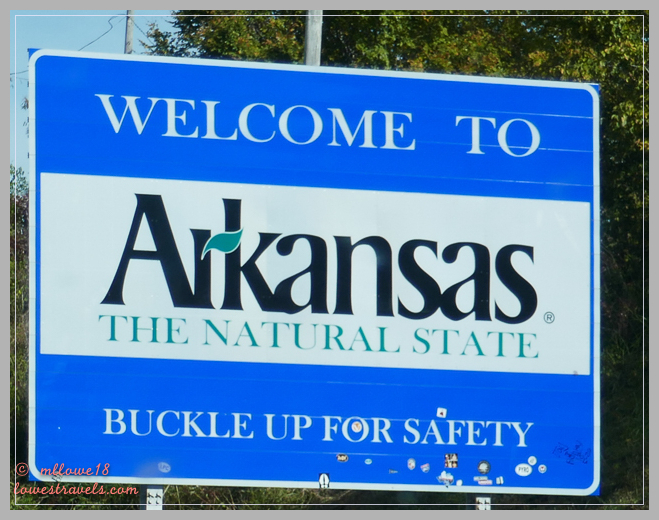 We have yet to visit Arkansas so this is a post that I am pinning for a future visit. Your photos are lovely MonaLiza. 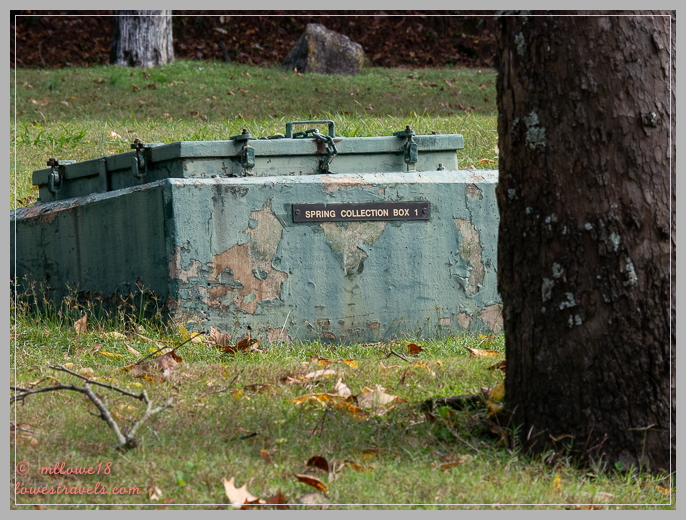 We stayed at Maumelle Coe Park, as well. It doesn’t bring back fond memories!! We arrived with temps near 100 and terrible humidity. Our site was unlevel and took a lot of boards and work to get level. We were both soaking wet from the extreme heat and NOT happy!! We did enjoy Little Rock and the Hot Springs. But we didn’t too much in length since it was so oppressive. We’ve tried to visit Hot Springs NP a couple of times and bad weather has forced us to reroute. But I still want to go there. And I especially want to go to the brewery! Looks like you hit the fall colors at the perfect time. 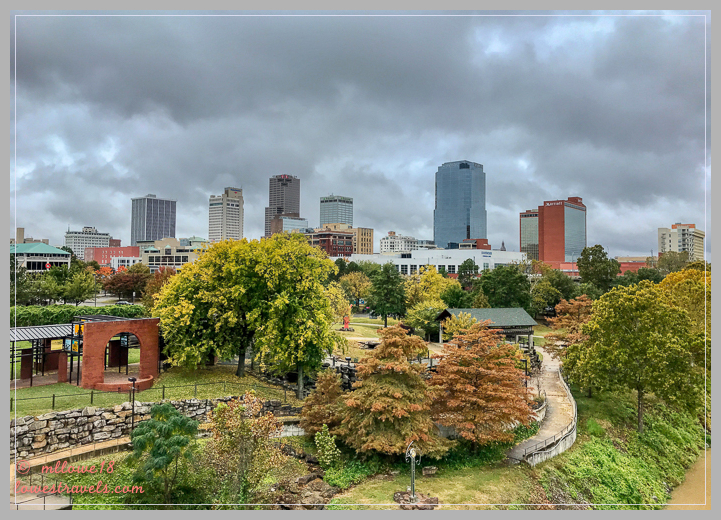 Little Rock is also on our list and looks interesting from your photos. I would have gone to the Purse Museum with you. I love random things like that! Like Steve, Eric probably would have done something different, LOL. Oh Laurel, I know you like to soak in hot springs, so I suggest you make a reservation for couples at Quapaw or Buckstaff. And yes stop by the brewery, the beer was excellent. Boy is that a beautiful site at Springhill and what a picture of Betsy reflected in your lake at your later site. Your pictures of Hot Springs are wonderful. I’m amazed that you couldn’t get a reservation for a bath and it wasn’t even summer. Wish we’d been there in the fall. I love your pictures of the beautiful foliage colors. I was LOL at even the idea of a purse museum. Now I know there must be a museum for every single thing somewhere. A lovely state capitol building. We never seem to visit them. I guess because we avoid cities. Yes, Sherry, we had a good site at Springhill and wished we had another day just to hang out. Lots of Cardinals came for a visit, which is STeve’s favorite bird. The next bath reservation for a couple was late in afternoon, and we had no plans of staying that late, besides we have to rent slippers and stuff for they were a bit strict on what you can wear at the bathhouse. What a great reflection of Betsy!!! While I’ve never been a fashionista purses and shoes have always intrigued me as some of them are works of art. Thanks Faye, my iPhone always do the reflection trick. The musuem was actually interesting when I read all the stuff that women put inside their purses through the century. You lost me at “purses” but I came right back with the beer and hot springs! Ha ha. guys just don’t like the sound of a museum of purses but it was a good rainy day activity. 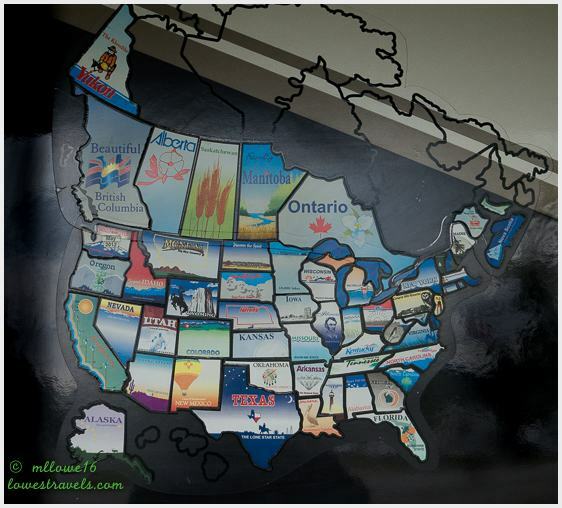 I’ve always wondered why the state name isn’t pronounced ‘Our Kansas’. :). Beautiful capitol building, MonaLiza! Ha Ha, that’s a good one Jim. 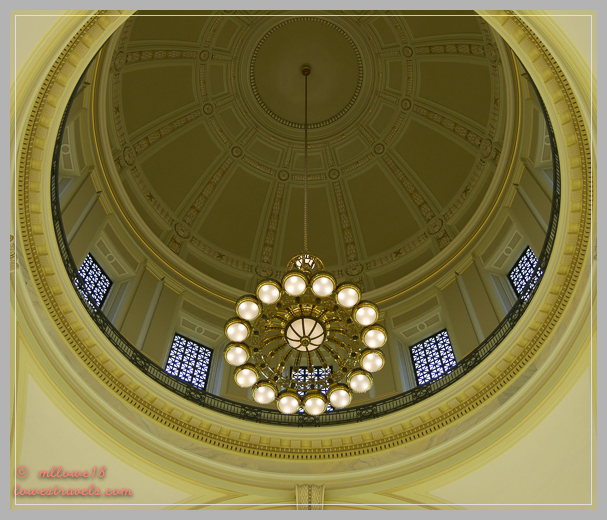 Love the reflection photo and the two floors with staircase in the Capitol. Little Rock looks like a place I’d be happy to explore. 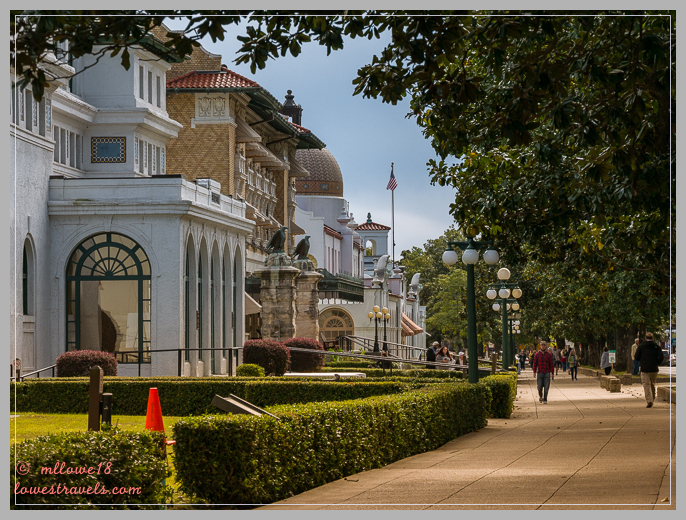 Sometimes these southern cities have a lot to offer especially history related one. Our couple of days was not only short, but weather was not nice to us. I hope you’re able to skirt around this next storm heading east. Thank you, we are now near the GA/FL border. We’ve always just moved through or around that area on our way to somewhere else. The COE park looks wonderful! Our son did his undergraduate studies in Saratoga Springs where folks from NYC came to take the baths. We never made a reservation there though, perhaps we should have! I would have loved the purse museum (although I never carry one). One of my favorite museums was the Bata Shoe Museum in Toronto….Dave even enjoyed it. Stay dry guys and enjoy your trek. We only had two days there in bad weather, for there were still a few more things we wanted to do. Maybe next time if we had to be on this route again. We’ll have to do all this one day as well! And now I know I’ve got to visit the purse museum and I’m sure Bill will go off exploring! Steve have any suggestions? And we’ll have to check the weather first….We’ve had our share of torrential downpours! Steve went to the Little Rock Central High School which was the first school in civil rights history to integrate blacks in school in 1957. I wished I had time to take the tour. The Purse museum can be done in an hour.